I came to Wassaic for a change of pace, and perhaps a change of practice, from my usual life in London. I’m living, working, and studying there, but I’m from the United States, so I was excited to return and experience a community of artists working closely with each other in this country. I would say that, if anything, Wassaic offers that: a closeness or intimacy that’s really informative. Over the month of August, I got acquainted with my fellow residents quite well. Getting to know other people’s work can teach you a lot about yours and the way you approach making. Traditionally being a sculptor and installation artist, I had planned to work on video installation during my time here, and while I did just that, my perspective on this type of work changed drastically. Through conversations with residents making completely different work than mine — sound, painting, participatory performance, etc. — I tried working with different spaces in the Luther Barn and actually abandoned much of my pre-decided content in favour of simplifying my work, or making it more honest about the circumstances in which it was conceived. In the end it was the spatial oddities of the barn and the atmosphere of transience brought about by the sound of passing trucks on the highway that completed what I was trying to achieve here. 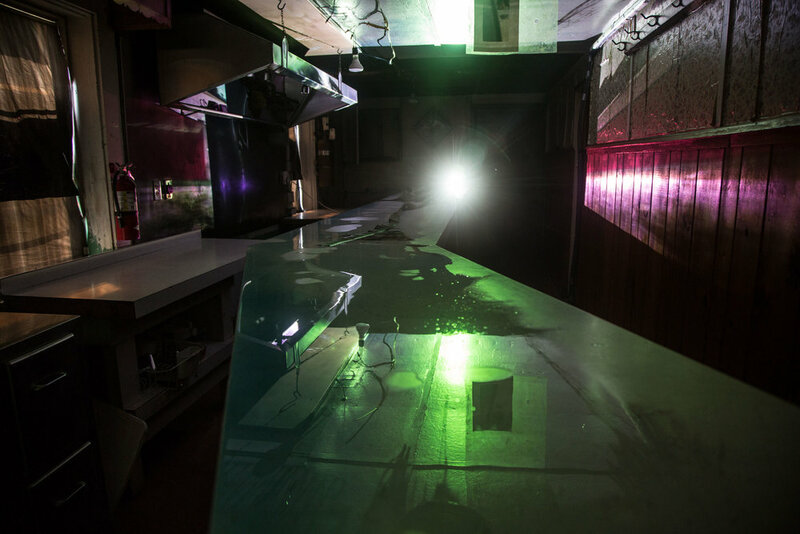 It all came together during August open studios when I created a sound and video installation in the lunch counter on the second floor of the barn. It’s such a strange and wonderful space that seems like a ghost of past social exchanges; where people used to meet for food after purchasing cattle in the barn’s auction ring. This type of economically shaped Americanism is something I was exploring through video and sound recordings of my writing, resulting in a historical-site-specificity that the rural qualities of Wassaic contributed to greatly. I wish I had more intelligent things to say about Wassaic other than “it was brilliant.” But it was brilliant, and challenging. Ample time and space to make work is often talked about as a wholly positive and generative environment for artists. But I found it quite tough. All this latitude and fresh air can actually create a crisis of confidence and make you second-guess major decisions in your practice. But this challenge was really interesting to work through, and I think it produced successful work in the end, both for me and my fellow residents. It’s the difference between business as usual and having the time to stop and truly consider what you’re doing. You started working on sculpture and installation very early, yes? When I was sixteen or seventeen. I was always very concerned with the phenomenology and physical effects of an odd space, and the reason I came in here was because it seemed like a more dynamic space. I usually end up making the studio an installation space. I’m also interested in art as an academic thing that can be really researched and studied. I think that comes from trying to make sculpture or video while writing literary essays, and trying to think about these things in similar ways — like a general criticism can be applied to things. That’s how I work. Tell me about this piece specifically, then. I'm interested in how you think of the “phenomenology” of the space here, in particular. I work a lot with linear planes — things that move along a line visually or kinetically. This video is a train ride out of Chicago, but it's obscured because it's projected into a space without surfaces to catch the light and form a cohesive image. So the video isn’t really a picture, but more like a treatment that your eye can't settle on. It’s looking at very intimate things from an incredible distance. That unsettling or obscured view of things is something I've been looking at a lot recently. And how has academic research played in? There’s definitely research in this, but it all comes out of personal desire. This is a very generic view from a train, but it's also a singular one — I thought to put the camera up and catch it. So all of the content is drawn from intimate looks at industrial circumstances. This strip of oil refineries and steel plants is all slightly set away; you're looking through shrubbery at these things passing. The research is in collecting things and then figuring out what they mean in relation to each other. I’m looking at the contemporary state of industrial history, and at how intimate things get disseminated online or even in public spaces. These pieces create a little sphere, and the work functions in terms of itself. And that's how an essay works: it has to thoroughly relate to itself to convey a perspective on something. That's the way I work — collecting things, and then debasing or altering them so that they can function in the little context where they live. Is your work always site-specific, then? Not always, but there’s quite specific materiality to it. Right now, I'm working with a lot of plastics and things that come from construction and packaging because they relate to industrial urban circumstance, and bodies, and men, and work. But I usually find that that's where my ideas come from — trying to work out a space rather than just making things that could go anywhere. It’s very difficult to transfer my work from place to place because it ends up functioning in terms of the space and then becomes conceptually immovable. I like that this piece operates in both a digital and a physical realm: there’s the video, but there's also this piece of construction material on the counter extending — via what looks like water — all the way back to the projector. How do you view that relationship between the digital and physical? Well, to begin, this color is completely about trying to represent physicality without it being present, about translating the body and all of the purple and red tones that inevitably get produced in these crappy videos. And each physical component of the piece carries the other. The surface of the wet counter catches the light and the materials sitting in it — back into the space. The liquid is actually Barbicide, which is a comb disinfectant, but also an industrial cleaning solution that can clear surfaces previously contaminated. It’s another material that speaks about physicality (or fear of it), and about grooming and wanting to look a certain way. One thing has to say something to the other to make sense or to create that sphere. Otherwise I’d just be a collector putting nonsense together. Are sexuality and grooming and masculinity usually topics that your work explores? It’s usually just about, I don’t want to say “voyeurism,” but feeling a want for something in the distance. In this piece, it happens to fall on this male urban population that you watch when you’re commuting. So it's more about the desires that come up from these things rather than specifically grooming culture or queer theory. It’s more personal, and I think it's important that it's a little uninformed because it's about a singular, everyday view that isn't the result of a ton of analysis. I'm looking at very common, very accessible things that don't contain an obvious link to masculinity or sexuality, but I hope that in what I’m building they can be looked upon in that way.